Framed Print of Margaret Vergh Gryffyth, horned woman by Prints Prints Prints at UtopyaCon. MPN: s27_572195_6989_461. Hurry! Limited time offer. Offer valid only while supplies last. FRAMED PRINT. 22x18 inch (56x46cm) Framed Print with Black Satin with Off-White Digital Mat. Artwork depicting Margaret Vergh Gryffyth, horned woman. FRAMED PRINT. 22x18 inch (56x46cm) Framed Print with Black Satin with Off-White Digital Mat. Artwork depicting Margaret Vergh Gryffyth, horned woman. Margaret Vergh Gryffyth, Welsh woman who exhibited herself with a 10 centimetre horn growing from her forehead. Professionally made to order in the USA. 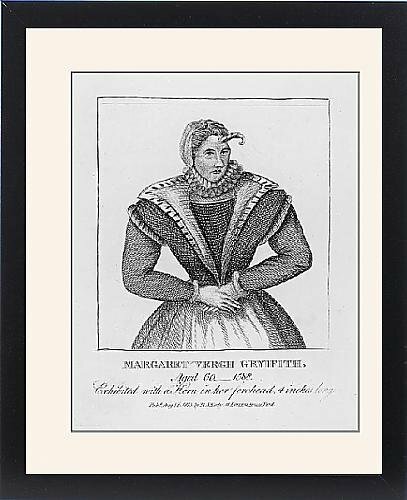 Artwork Description... Margaret Vergh Gryffyth, Welsh woman who exhibited herself with a 10 centimetre horn growing from her forehead.